Bruce Ely/The OregonianCyrus Hostetler screams after releasing a throw. EUGENE – Christina Scherwin was concerned Monday as she stood in the mixed zone adjacent to Hayward Field, watching Cyrus Hostetler talk to reporters. Hostetler, the former Oregon javelin thrower who competes for Oregon Track Club/Eugene, had just made the U.S. team despite finishing fifth in the Olympic Trials final on an injured left knee. Scherwin coaches Hostetler, and she wanted him in treatment. 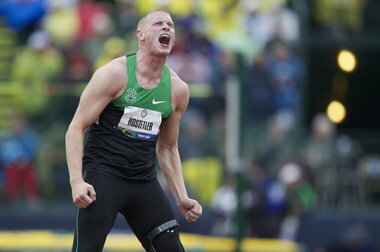 Injured knee or not, Hostetler will compete in the Olympics because he is one of three U.S. throwers to have met the Olympic “A” standard of 269 feet. Texas A&M’s Sam Humphreys won with a throw of 268-7, a personal record. He does not have the Olympic “A” standard and did not make the team. Sam Crouser, Oregon’s redshirt freshman, busted a 265-1 monster on his final attempt to finish second. He doesn’t have the “A” standard either. The guys who placed 3-4-5, Craig Kinsley, Sean Furey and Hostetler, have thrown the standard. They will represent Team USA in the London Olympics. It wasn’t an easy competition for Hostetler to watch, because Humphreys was knocking on the door from his opener, which sailed 264-10. Four of Humphreys’ five legal attempts went 263-11 or further. Then Hostetler had to watch Crouser’s finale get measured. Had Humphreys or Crouser reached the standard, it would have bumped Hostetler. And Hostetler was gimpy. His knees have gone under the knife more than Joan Rivers. His left knee buckled on him Monday on his third attempt. For a right-handed javelin thrower, the left knee is the one that sets – blocks in javelin parlance – for the throw. After three throws, four of the 12 finalists were eliminated. The final eight were given three more attempts. With the knee a real issue, Hostetler passed on his fourth attempt. It was Hostetler’s call, over Scherwin’s objections. And, she understood. She threw the javelin for Denmark in the 2004 Olympics. Hostetler fouled on his fifth attempt. But the knee didn’t buckle. He took his final attempt and threw 251-1, and again, the knee held up. “At the back of the runway, the thing that is running through my head is, ‘This is going to hurt, no matter what,’” Hostetler said. “I just had to do it, with that ‘no fear’ mentality you have to have in the javelin. It’s probably going to hurt, really, really bad. But it’s only for a split moment. You just have to bear through it. Crouser is the national high school record-holder. The prep record of 255-4 had been his PR, until he wound up and let fly Monday with his final attempt. Afterward, he was upbeat. “I’m really glad I came through on that last throw and I was able to pull second out,” he said. Crouser struggled early in the competition, even sending one throw out of the sector and perilously near a group of pole vaulters. But he put it together in the end. “I finally caught one a little bit,” he said. Sean Keller, who just finished his senior year at Heritage High School in Vancouver, finished eighth overall with a best mark of 246-5.